LG pairs a combined Freeview+ PVR and DVD recorder with a 3.1 speaker system, but does it make for a great night of TV? It's probably not the best Freeview DVD/HDD recorder you can buy or the best home cinema sound system but this package remains pretty good value all round, though the lack of dual Freeview recording to hard disc is disappointing. 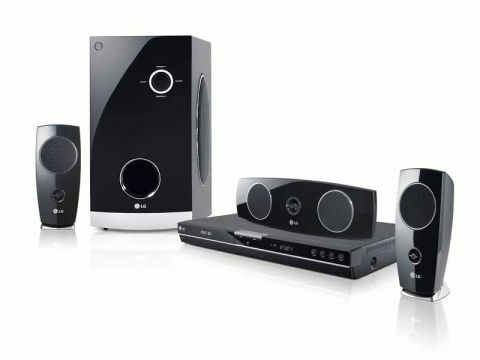 The LG HRT403DA combines a 3.1 speaker system with a multi-format DVD recorder and Freeview+ certifi ed 160GB PVR. The latter is capable of analogue and digital reception but you can't record two digital or analogue channels at once. The recorder is slim, albeit with a broad footprint. A partly mirrored fascia sports a nice blue LED display and five operating buttons. The speakers are aesthetically pleasing, with the subwoofer getting its own display. The remote has rather tiny buttons but it's functional, with the audio controls getting their own section. There are direct access buttons for the main functions (e.g. HDD, DVD, TV/AV) or pressing the Home button (which could be larger) brings you to the main drop-down menu from which you can select each in turn. We like the slick dissolving menus but they can suffer from poor use of English, as does the manual. The Freeview EPG calls the lack of a need for split recording 'impossible to separately record the program'. You can see the EPG data as a full eight-day programme grid of details for six TV or radio channels or bring up now-and-next information only. You can also skip day by day and check synopses for all programmes. Recordings can be scheduled directly from the guide and you're given the option to record once, record the series, schedule a split recording or record a related show suggested by the broadcaster (where supported). In addition there's a 16-event manual timer. You can also record from external SD sources such as a receiver (RGB Scart is the highest-quality option) or camcorder plugged into the DV input. The recorder offers five quality settings that can be set in advance XP SP, LP, EP and MLP. The highest, XP, stores up to 43 hours of recordings on hard disc or an hour per DVD. Using the lowest, MLP, will fit up to 477 hours on a hard disc and 21 hours on DVD. You can alter the quality if you're dubbing between the hard disc and DVD (or vice versa). Recordings made in MLP mode are so blocky as to be a last resort but moving up the scale things rapidly improve – even LP is passable enough for TV recordings. Recordings stored on hard disc and DVD are accessed via separate menus where they're displayed as thumbnails and can be renamed and placed in folders. You can edit them and create chapters for DVDs. Timeshifting TV is possible and only takes place after you press pause. A progress bar appears, and you can fast-forward and rewind timeshifted (and recorded) material at six speeds indicated by arrow symbols. Freeview pictures look agreeably sharp via the HDMI output and colourful via the RGB Scart option too. DVDs can be upscaled to 1080p but results are average. Watching The X Files: I Want To Believe and The Colour Of Magic pictures were detailed but still a tad soft-looking displayed on our new 37in Samsung LCD TV. The recorder also capably played DivX and MP3 and JPEG files from the hard disc, discs, and fl ash drives inserted in its USB port, and an FM radio tuner is included, together with an antenna. The 400W 3.1 speaker system is satisfying overall. Two channel Freeview broadcasts are crisp-sounding via the digital output especially, while the 3.1 setup deals well with DVD sources, creating plenty of depth. Dialogue from the centre speaker remains clearly audible even in noisy scenes. The jewel in the crown is the Virtual Sound Matrix setting, which effectively creates 5.1 virtual surround effects without swamping dialogue. However, the subwoofer can sound a tad muddy with thumping music scores and bass effects.